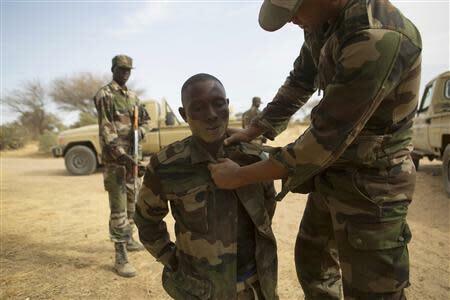 DIFFA, Niger (Reuters) - On a dusty training ground in Niger, U.S. Special Forces teach local troops to deal with suspects who resist arrest. "Speed, aggression, surprise!" an instructor barks as two Nigeriens wrestle a U.S. adviser out of a car. The drill in the border town of Diffa is part of Exercise Flintlock, a counter-terrorism exercise for nations on the Sahara's southern flanks that the United States organizes each year. 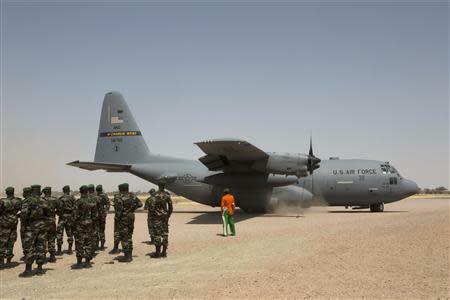 Washington's aim is to tackle Islamist militants in the Sahel region while keeping its military presence in Africa light. A growing number of European nations taking part shows their increasing concern about security in West Africa. Central to the international effort is a blossoming relationship between the United States and France, the former colonial power and traditional "policeman" of the turbulent region. When Paris deployed 4,000 troops to fight Islamist militants in neighboring Mali last year, the U.S. military lent a hand by airlifting French soldiers and equipment, providing intelligence and training African forces to join the operation. French troops are stretched by hunting the militants in Mali and tackling religious violence in Central African Republic, so only a handful participated in Flintlock. Nevertheless, they welcomed their new partnership with Washington. "The Americans want to get involved in Africa. That's good for us. We know that with the Americans it will be more efficient," said a French Special Forces officer, who asked not to be named. "We use American logistics - that's what we are missing. On the other hand, we provide the local knowledge." The United States fast-tracked the sale of 12 Reaper drones to France last year, the first two of which started operating in Niger in January alongside U.S. drones already there. In a reminder of the partnership, a drone quietly taxied past troops and dignitaries at Flintlock's closing ceremony in the capital of Niamey before taking off to scour the Sahara. Military experts say direct U.S. military action in Africa is limited to short raids on "high-value" targets in places such as Somalia and Libya, while French troops take on longer, bigger operations. J. Peter Pham, director of the Africa Center at the U.S.-based Atlantic Council, said this arrangement suited U.S. military planners who face budget cuts and a diminished American appetite for combat after conflicts in Iraq and Afghanistan. However, he warned that the French military was at the limit of its ability to strike militants hard. "If the French are not able to provide that blunt instrument, is the U.S. willing to do so?" Nine years after the Flintlock exercises began, the enemy has evolved from a group of Algerian-dominated fighters focused on northern Mali and now threatens nations across the Sahara and the arid Sahel belt to the south. For most of 2012, militants occupied northern Mali, a desert zone the size of France. Scattered by a French offensive last year, many are believed to be regrouping in southern Libya. Hundreds of people are being killed every month in clashes with Boko Haram militants in northern Nigeria. Many in Niger fear this conflict could spill over the border and the government in Niamey has appealed for more military support. This year's three-week Flintlock exercise - involving over 1,000 troops from 18 nations - was the biggest yet and runs alongside more permanent training by U.S. Special Forces in Niger, Mauritania, Senegal and Chad. Training in Diffa, only a few kilometers from where Boko Haram militants are fighting the Nigerian army across the border, ranged from basic patrolling skills and setting up checkpoints to sharing intelligence and providing medical care. In a region where armies often lack basics such as ammunition for target practice and fuel for vehicles, the quality and tempo of the U.S.-sponsored exercise eclipses the training most soldiers in the region receive in a year. 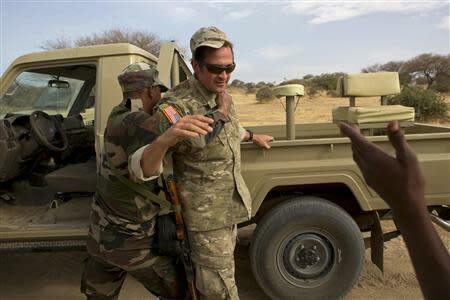 Colonel Mounkaila Sofiani, the local Niger commander, said Flintlock and other U.S. initiatives helped his country to tackle threats from the west, north and south better. "Little by little people are being trained," he said. "Once there are enough, they'll form the spine of a reliable force." Training is meant to build up coordination between armies but Sofiani said just finding radio equipment compatible between nations is difficult. In the field, officers exchange mobile phone numbers to bypass blockages in official channels. A lack of trust between governments also hinders responses. At a recent meeting of intelligence chiefs, the Nigerien and Libyan representatives argued over the risk of instability spreading from Libya's lawless south, a diplomat told Reuters. Coups in Mauritania, Niger and Mali since the Flintlock exercises began also halted cooperation until civilian rule was restored. Mali's 2012 coup, led by a captain with U.S. training, opened the door to the Islamist takeover of the north, prompting questions about what the years of exercises had achieved. Pham said better military capabilities had not been matched by improvements in governance, citing a failure by Mali to tackle corruption. Chad's military, however, has won praise for leading the charge alongside French troops in flushing out the militants from Mali's desolate northern mountains. U.S. officials stress the exercise is African-led and are wary about people reading too much into U.S. troops being on the ground near African conflicts. But the show of foreign support is popular in Diffa. "It sends a message to Boko Haram and others," said Inoussa Saouna, the central government's representative in Diffa. "Before Mali, we thought terrorism was a problem for whites but now we've experienced it ourselves."